The guard of the famous Cardinal Richelieu wore this tabard, similar to the Musketeers, as the sign of office. 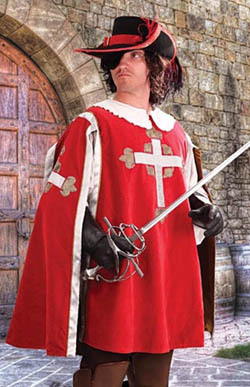 The blood red tabard is made of a heavy red cotton velveteen and lined and trimmed in antique gold. The cross fleury is embroidered on both the front and each of the hanging sleeves. Dry Clean Only.